These beautiful insects, often described as ‘flying flowers,’ are also useful pollinators and signal a healthy environment. Butterflies can bring colour and drama to your landscape all year, depending on the climate. They are an indicator species and a sure sign that your environment is healthy and safe. Fulfill a few simple requirements and you can enjoy their company yearround. Butterflies need a warm, sheltered area so shrubs, trees or a hedge should provide wind protection to create a suitable microclimate. Inside this shelter, rocks and evergreens are useful to create a warm perch where butterflies can sun themselves. Butterflies like large areas of flowers for nectaring so plant clumps of flowers rather than single specimens. Clusters of flowers and daisy shapes make better landing pads. They need a range of flowers to provide nectar. To have butterflies visiting the garden over winter, different nectar sources should be flowering throughout the year. Different species need different larval food. Milkweed, such as swan plants, for Monarchs, is very easy to grow, while Red and Yellow Admiral caterpillars need nettles, often considered a weed. They also need plants with large or long leaves such as flax and dwarf cabbage trees, which act as rain-shelter umbrellas when the caterpillars pupate, providing the perfect place from which to hang. Protection from predators and parasites is important, so remove any wasp nests from your property. 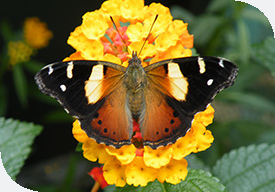 Focus on being pesticide-free as butterflies are very sensitive to insecticides. See links opposite for natural ways to restore balance to the garden.